fanloremod - The IFD 2019 Fanlore Challenge Has Returned! fanloremod - It's time for April Showers 2018! fanloremod - Introducing: The International Fanworks Day 2018 Fanlore Challenge! otw_staff - Want to talk about Fanworks & Fan Communities? fanloremod - Fanlore wants YOU (to become a gardener)! fanloremod - April Showers Is Back! fanloremod - March Update: Full Steam Ahead! fanloremod - The Fanlore Committee is looking for your feedback! The IFD 2019 Fanlore Challenge Has Returned! 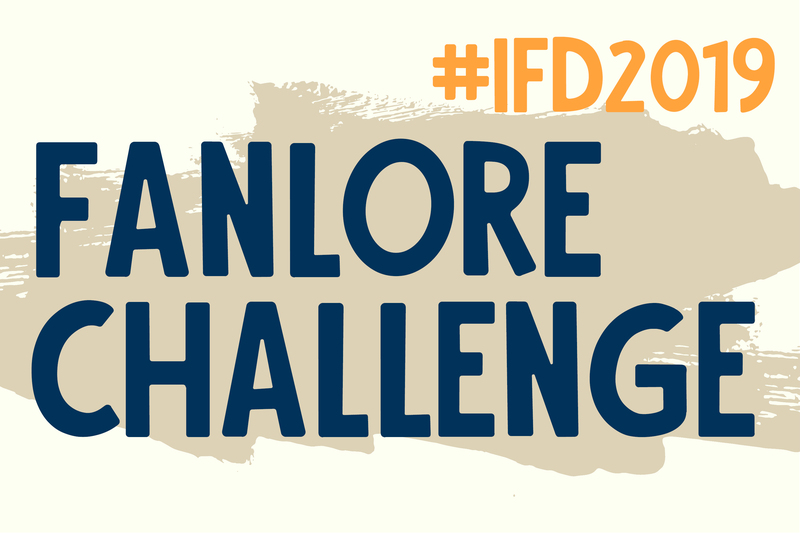 Come celebrate International Fanworks Day with Fanlore this week by participating in our IFD 2019 Fanlore Challenge! Fanlore is pleased to announce that our week-long editing challenge for International Fanworks Day is making a comeback! Every day from 11-17 February, you can take part by completing the editing task of the day – and be rewarded with an awesome badge for your user page. Day 1, February 11th: Get started by creating a Fanlore account! Day 2, February 12th: Add some fanwork examples to any trope or genre page. Day 3, February 13th: Add some fanon details to any character page in your fandom. Day 4, February 14th: It’s Valentine’s Day! Share the love by adding some ship examples to any fandom page. Day 5, February 15th: Happy International Fanworks Day! Celebrate fandom by adding to the page for a fan community that is meaningful to you. Day 6, February 16th: Find a short page on the wiki of any kind, and add to it! Day 7, February 17th: For our final challenge, edit any page that is part of a FanloreProject. If you’re unsure about what counts, feel free to ask on that project's Talk page. If these tasks seem too easy for you, there are bonus tasks for more experienced editors on the IFD 2019 Fanlore Challenge Fanlore page, so give those a go! You can qualify for a badge by doing either one of the day’s tasks – or both. Happy editing, and happy IFD week! Feel free to ask any questions about the challenge in the comments of this post, or contact us on Tumblr or Twitter. It's time for April Showers 2018! It’s that time again… Get ready for Fanlore’s April Showers challenge! Join us for the event that celebrates fandoms old and new, add your memories and favourite fanworks to Fanlore, and earn some cool badges for your user page! We’re changing things up slightly this year, with a different editing task for each day of the week, which you can carry out on any of the spotlighted fandom pages for that week. For each editing task that you complete, you’ll earn a badge to display on your user page! Here are the fandom pages that you can edit to earn a badge in Week 1! We’ll be featuring a new set of fandom pages each week, so be sure to check back next week for our Week 2 list. Each fandom will be highlighted on the fanlore_news Twitter and the otw-fanlore Tumblr throughout the week, and you can follow along by tracking the hashtag #FanloreAprilShowers!! But remember, you don’t have to edit a fandom page on the same day that it’s featured to qualify for the challenge. You can carry out the day’s editing task on any of that week’s fandom pages to earn a badge. If you’re new to Fanlore and don’t know where to start, you can always stop by our New Visitor Portal or talk to a friendly Gardener. Have fun, and we look forward to seeing you on the wiki! Introducing: The International Fanworks Day 2018 Fanlore Challenge! Come celebrate International Fanworks Day with Fanlore this week by participating in our IFD 2018 Fanlore Challenge! Fanlore is proud to introduce a brand new week-long editing challenge in honour of International Fanworks Day. Every day from 12-18 February, complete the editing task of the day and be rewarded with a badge for your user page! Day 1, February 12th: Make sure you can join the fun by creating a Fanlore account! Day 2, February 13th: Add some example ships to any fandom page. Day 3, February 14th: Give your OTP some love by adding some fanwork recs to its page! Day 4, February 15th: Happy IFD! Add your favorite classic works to the Fandom Classic page! Day 5, February 16th: Add some fanwork examples to any trope or genre page. Day 6, February 17th: Details, details! Sometimes elaborate fanon is how we show our fandom love. Add some to any character page in your fandom! Day 7, February 18th: Whew! You made it! One final task: find any page on the wiki that could use some attention, and add to it! If these tasks are too easy for you, there are bonus tasks for experienced editors listed for each day on the IFD 2018 Fanlore Challenge Fanlore page. Check it out! Happy editing, and happy IFD week! We’re excited to announce a new way to contribute to Fanlore: Advanced Editors! What is an Advanced Editor? Advanced Editors are editors who have made significant contributions to Fanlore and have special editing privileges: They can move and delete pages. Advanced Editors are not official Fanlore volunteers. There are no requirements or duties attached to the status, just more editing power! The Fanlore Committee will be holding another open house to chat about Tropes and Ships in a few hours, on Saturday, September 9 from 5:00 to 7:00 UTC (what time is that in my timezone?). Come talk about your favorites and learn how to create or add to existing pages! Here's the link to the chatroom. Come join us! There will be many other events this month celebrating the 10th anniversary of the Organization for Transformative Works. Check out the others, too! Want to talk about Fanworks & Fan Communities? The OTW’s Fanlore Committee will be holding an open house to chat about Fanworks and Fan Communities with you on Sunday, September 3 from 19:00 to 21:00 UTC (What time is that in my timezone?). Come talk about your favorites and the ones you've known. Check out the pages for them on Fanlore and brainstorm suggestions for more information that could be added to the site! Take part in the chat! If anyone is going to fandom conventions and wants to help promote Fanlore, I have two flyers from 2011 that were approved by the Wiki Committee to hand out. I also have flyers for other projects - Fanzine Preservation (multiple universities), the Sandy Hereld Digitized Fanzine Archives at TAMU, the Media Fandom Oral history project, the online zine about vidding, Videlicit etc. PM me or email me at morgandawn @ gmail.com and I can email you the flyers. Confluence 4-6 August, 2017 - Sheraton Pittsburgh Airport Hotel - anyone going? Dragon Con -- 1-4 Sept, 2017 Atlanta, GA - anyone going? World Fantasy Convention 2017 -- 2-5 November 2017 San Antonio, TX. - anyone going? Fanlore wants YOU (to become a gardener)! Fanlore is recruiting gardeners to help us with Fanlore! Do you like writing about fandom? Gardeners are editors who work on Fanlore and take additional responsibilities regarding the wiki’s maintenance. In addition to adding content themselves, they make sure text isn’t deleted indiscriminately and tidy up after other editors, to help new content better fit the wiki’s guidelines. They can also participate in internal discussions about Fanlore events, policies, and documentation. No technical experience is required—you just need to know and love Fanlore, both as a user and an editor. If that sounds like you, come and join us! As mentioned in some of our updates from earlier this year, we've updated the Fanlore main page! We hope this version helps new users find help and other relevant info more easily. The design change is still very much open to suggestions — if you have ideas, please add a comment to the talk page or contact us via email. We're still working on three sections we'd like to add to the new main page. First, a 'help wanted' section will link a few stubs that need work and rotate regularly. Next, 'featured article' and 'featured image' sections, which will spotlight each week one article that editors deem thorough and helpful enough and one image with interesting description and source information. Here's the process we're considering for the nomination and election of featured articles and images. Please let us know what you think via talk page comment or email! i've noticed a lot of link rot, especially since the recent changes at LJ... links are either dead, or link to posts that are now locked (friends or private). Is there an automated spider/robot to find these links, or do we need to manually flag them... and once identified, what can we do to fill in the info that is now lost? Fanlore will be adopting a DMCA policy similar to Wikipedia's. This policy does not significantly change Fanlore's existing policies, but simply protects Fanlore from money damages and presents copyright holders with an additional recourse if they believe their work is being infringed. The Digital Millennium Copyright Act (DMCA) is part of US copyright law, 17 U.S.C. §512. Compliance with the DMCA protects us from money damages in any case where someone posted infringing content on Fanlore or AO3, as long as we took down that content when properly notified about it. The DMCA provides an alternative option for a copyright holder who believes their work is being infringed on Fanlore. It does not change our policies regarding the use of copyrighted material on Fanlore (see Fanlore:Copyright). We will still decline to remove noninfringing, transformative or fair use content. We already ban copyright infringement, and may permanently suspend a user who repeatedly posts infringing materials on Fanlore. Copyright holders do not need to file a formal DMCA takedown notice to contest the use of their material on Fanlore, and are encouraged to seek resolution by sending an informal request to the Fanlore Committee. Why would Fanlore want to do this, if it is going to continue looking at fair use? To put it briefly, having a DMCA policy makes it easier to shake off trolls. For copyright owners/businesses just interested in demanding thousands of dollars, it's not worth sending us threatening letters if we have a DMCA policy, since we are protected against money damages. Doesn't the DMCA require websites to take down content regardless of fair use? That's how most providers, most of the time, implement it, because that's the cheapest way to do it, and most providers don't have ideological commitments to fair use that outweigh their desires to save money. Wikipedia, however, has a DMCA policy and a commitment to fair use, and follows the policy we are adopting. We believe that we can remain committed to fair use while providing a streamlined way to address true infringements. The policy will go into effect in two weeks. During this time you are invited to voice any concerns you have with the wording of the policy, e.g. if something is unclear. Note that we will not change the content of the policy. You might also want to check out Homestuck, Wynonna Earp, and Midsomer Murders pages, which all got some love on Fanlore this week! Though April Showers has now come to an end, the documentation of fannish history—our history—never ends at Fanlore. All fan stories and perspectives are welcome. If you're new, come join the fun at by visiting our New Visitor Portal! Another week of April Showers come and gone! Join us in telling your fandom story or filling us in on your fandom's history! Every fan perspective is welcome on Fanlore. Get started by visiting our New Visitor Portal so that you, too, can participate in April Showers! April Showers continues this week with a whole new set of fandoms! Some of these are still stubs, so join us! Don’t be shy—every fan perspective is welcome. Tell your fandom's history or your favorite fandom stories! If your favorite fandom's missing, help us fill in the blanks! Here’s our New Visitor Portal and a Guide to Participating in April Showers to help you get started! As April Showers rolls along, the first featured fandoms have been revealed! We invite you to tell us your history, your stories; share your memories and experiences; preserve your fannish culture — in these fandoms or in any others! The fandoms highlighted this week are listed below. Some of these pages are still stubs and can use some TLC; even those that aren't can always benefit from additional fannish perspectives! fanlore_news Twitter and the new otw-fanlore Tumblr! If you're not sure where to start, check out our New Visitor Portal and the new Guide to Participating in April Showers. Have you created or edited any Fanlore pages for April Showers? Tell us about your contributions! This year, April Showers is back as a Fanlore-only event! We invite you to bring us fannish April showers by digging out those old zines, memories of past cons, archived personal webpages, tales of shipwars and fannish events, and more! Help us celebrate fandom's history and diversity by telling your tales on Fanlore. April Showers is an annual event started in 2011, originally a collaboration between Fanlore and our sister project, Archive of Our Own. Its purpose is to celebrate and preserve fannish history by revisiting old fandoms and promoting news ones. Read more about April Showers on Fanlore. We are thrilled to also announce that Fanlore is now on Tumblr! Check us out at otw-fanlore. To help kick of April Showers, we will be highlighting a different fandom every day of the month on our Tumblr and Twitter. Follow us at otw-fanlore and fanlore_news and look for the hashtag #OTWAprilShowers! Are you new to Fanlore, or just to April Showers? We've created a Guide to Participating in April Showers that will explain the basics. If you still have questions, don't hesitate to comment below or to contact us. March Update: Full Steam Ahead! This month we’ve been super busy preparing for April Showers that start next week and we hope you are as excited for the event as we are. April Showers is an annual event where we celebrate fannish history by spotlighting a different fandom every day of the month. If you want to participate but aren’t sure how or where to start, we prepared a short help page with a lot of useful tips! After a feedback period, we also implemented the Japanese version of Fanlore’s image policy and purpose aimed at non-English speaking doujinshi creators. It was a true labor of love and we’re really happy it’s finally online. In other good news, we’ve mentioned in our February Update that the Wayback Machine stopped archiving AO3 links and now we are thrilled to let you know that the problem has been solved! You can learn more about the situation here. After we implemented the new and improved New Visitor Portal, we started working on the new revamped Main Page. After brainstorming, we came up with a new draft, which you can see here. As always, we welcome any and all feedback as we work on the details. Feel free to leave your comments in the talk page of the draft or using our contact form! As of March 26, Fanlore has 41,353 articles, which have undergone 719,987 revisions. If you're up for doing one more, why not log in? See you on Recent Changes! The Fanlore Committee is looking for your feedback! Some time ago, the Fanlore committee was approached with concerns that non-English speaking doujinshi creators might misunderstand Fanlore’s image policy (or be completely unaware of it, if they stumble upon the site randomly) and think that we allow the upload of full unauthorized scans of doujinshi. To ease their minds and explain more about Fanlore’s policies, we drafted an explanation and had it translated into Japanese. The purpose of the Fanlore wiki is to give fans a place to record information about their fannish activities and communities. Fanlore is an information site, not an online gallery or a place to post entire fanworks. Things like uploading a scan of a whole doujinshi or a translated scan of a whole doujinshi are absolutely not allowed on Fanlore. Links and pictures on Fanlore have to be relevant to an article, and there must always be attribution for the fan artist. This wiki is a project of the Organization for Transformative Works, a US-based non-profit organization with members from all over the world that works to support fans. Among many other activities, the OTW provides information about the law to fans, creates software for archiving fanworks in the form of the Archive of Our Own, and publishes academic works about fans. The purpose of the Fanlore wiki is to give fans a place to record information about fan culture and history. Like all other OTW projects, the wiki is a not-for-profit project that is created entirely by fannish volunteers of many nationalities. Many contributors to this wiki talk about Japanese fans and fanworks, and some also link to Japanese websites and post pictures such as covers of doujinshi they love. Fanlore uses the same linking and image policies as, for instance, the US version of Wikipedia. On the English-language internet, it's normal to link to any website without asking permission, and sometimes also to re-upload images of other people's work in limited ways. US copyright law also has a "fair use" clause that says copyrighted works can be re-used without permission under some circumstances, for instance news reporting, education, or parody. This fair use clause is very important to US fans, because many fans and researchers believe that the fair use clause makes it legal to create fanworks in the US. Because preserving the fair use clause is so important for fans, Fanlore must allow fans to link to any website or upload a picture from fanart like illustrations and doujinshi, if that picture is relevant to the wiki article they're writing. If part of a fanwork is shown on Fanlore, the fanwork's original license does not change. The person who created the picture does not lose any legal rights they had to their work or its use. If a Fanlore user has added an image from your fanwork in a way that you're uncomfortable with, please contact the Fanlore administrators, and we will do everything we can to help. If the image was added in a way that's consistent with the fair use clause, it may be impossible for the Fanlore administrators to remove it entirely. But even in such a case, we can also change the size of the image, upload a different version, crop the image, or remove identifying information from it. We look forward to hearing from you! If you'd like to write about your experiences as a fan or make corrections to Fanlore articles, please go here to make a free account and add your voice. We plan to post both English and Japanese versions on a separate/dedicated Fanlore page. It will be linked to from the main image policy page as well as in the doujinshi infobox template to ensure that Japanese fans will be able to see it. Before the page goes up on Fanlore, we want to hear from the fans! If you are a member of the Japanese fandom, or know somebody who is knowledgeable about doujinshi, please read through the note and let us know if it addresses all the concerns one might have. Spread the word among your Japanese friends on social media and ask for their input as well. If they are uncomfortable communicating with us in English, please let them know they can leave us comments in Japanese. For the next two weeks, we will be gathering input from everybody before proceeding with implementation. Thank you in advance for all the help, and see you on Recent Changes! In the past few weeks, we've done some small changes, including improving our New Visitors Portal and increasing the frequency of news posted to the Fanlore main page. We're also starting to prepare for the upcoming April Showers celebration. This week, we're recruiting for new Fanlore committee staffers. These volunteers are responsible for dealing with various behind the scenes stuff to ensure that Fanlore runs smoothly. They respond to questions and complaints; help draft and improve Fanlore policies, categories, and tutorials; assist Fanlore gardeners and other editors; promote Fanlore; and do their best to improve it and plan ahead. No extensive experience is required—only reliability, teamwork, and an interest in fannish history and Fanlore in particular. If you think you might be interested, please check out the position details and fill out a volunteer application on our website. Join us! Lastly, an important note: the Internet Archive's Wayback Machine has stopped archiving all links to our sister project, the Archive of Our Own. There are several of these on Fanlore, and we of course strongly believe the Archive should be preserved, so we, in addition to the AO3 development team and the OTW Board, are doing our best to reach out to the Internet Archive team and learn the reason for this error. As of February 22, Fanlore has 40,970 articles, which have undergone 714,168 revisions. If you're up for doing one more, why not log in? See you on Recent Changes! Hello everybody and welcome to 2017! Hope you have your New Year’s resolutions ready. Our own 2017 plans include a lot of reviewing and improving of Fanlore to make sure it’s as accessible as possible. We’re starting off with redesigning of the Main Page as well as the New Visitor Portal. Visit our new draft of the Portal page as well as the the old version we are trying to improve upon and let us know if you have any suggestions! What should we include in there? Do you have any ideas that could help accessibility? What do you think new and potential editors could really use? Leave your comments in the Talk page for the draft. Take a closer look at the Main page and think of what is missing there. Share your suggestions in the talk page. Please remember, your input is incredibly valuable; not only due to your fandom knowledge (which we hope you’ll share on the various Fanlore pages), but also because sometimes, two heads are better than one. With that mind, try checking out recent questions asked in various Fanlore talk pages. Your voice and opinion matters more than you think! As of January 22, 2017, Fanlore has 40,734 articles which have undergone 709,760 edits. See you on Recent Changes!